Edmund: Dad,I don't need a chaperone. I'm 400 years old. Count Dracula: You live under my crypt, you follow my rules. Edmund: You're tearing me apart! Treehouse Of Horror 21 is a great Simpsons episode,guest starring Hugh Laurie and Daniel Radcliffe. In War and Pieces,Marge wants Bart and Milhouse to stop playing all their video games so they decide to give board games a go,but after playing a possessed board game all the other ones come to life. in Master And Cadaver,Marge and Homer go on a boat for a second honeymoon and find a stranded man (Hugh Laurie) who ran off a boat after nearly getting murdered by the host while the rest of them got killed,but Marge and Homer start to believe that he is the true murderer and is trying to kill them too. 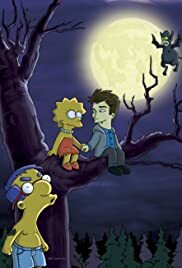 Then in Tweenlight,Lisa meets a new kid at school called Edmund who is a vampire,and the two fall in love,but the two fathers aren't happy about it. next up there should be a Tweenlight saga:blue moon.